Sure, you might have to dig into your banana split while eyeing down Karl the Fog, but San Francisco is home to a wild and magical world of ice cream options. This city knows its food, and our ice cream options are no less spectacular than our cold coffee drinks -- from high-end ice cream tacos to classic dip cones to vegan options, SF has a bit of everything -- you can even order an ice cream flight here. Your new summer goal: work your way through the best frozen treats in the city. When you’re in the market for a classic cone, lemon cookie is the way to go. Soft, creamy lemon ice cream dotted with crushed vanilla sandwich cookies are matched by a crisp waffle cone. 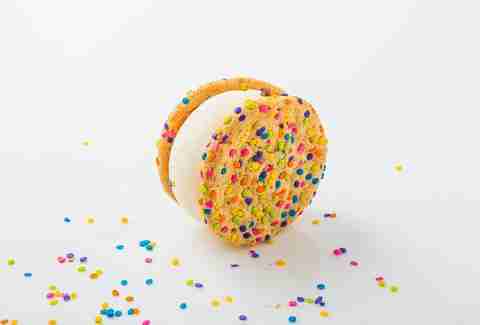 It’s a playful twist on cookies and cream, full of bright citrus flavor and vanilla, like a high-end Dreamsicle. You can grab a pint at your local grocery store, but you want try out this local favorite in its natural cone habitat. Frozen Kuhsterd's cupcake sundae pairs a full-sized Mission Minis cupcake with a scoop of frozen custard and a delicious topping, so you can choose the flavors for each part of the sundae, and create your ideal cupcake and custard mashup, or take a recommendation from someone who would know best. Founder Jason Angeles recommends the vanilla bean cupcake with Thai tea frozen custard and a condensed milk topping (yeah, that sounds pretty good to us). 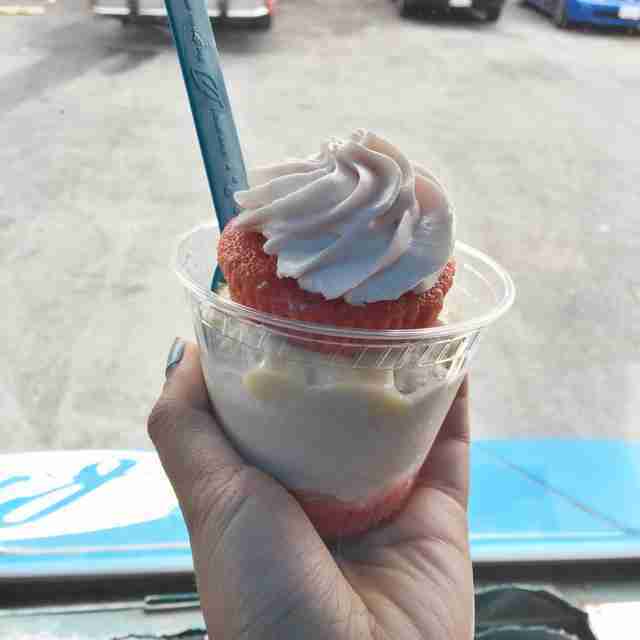 The Frozen Kuhsterd truck roams the city, but you can track it down on Twitter, or head over to Off the Grid at Fort Mason on Friday nights. Stay tuned for a new addition to the Frozen Kuhsterd: their first brick-and-mortar location is opening soon at 18th and Mission St.
Jacker Crack transforms your favorite nostalgic snack into an upscale ice cream experience. It’s a figurative rollercoaster for your tastebuds, veering between salty and sweet, crunchy and creamy. Sticky swirls of rich dulce de leche weave through a luscious popcorn-infused ice cream, studded with chunks of crushed peanut butter brittle. Wine flights, beer flights, cheese flights -- isn’t it about time ice cream got into the flight game? San Francisco’s Hometown Creamery has got you covered. 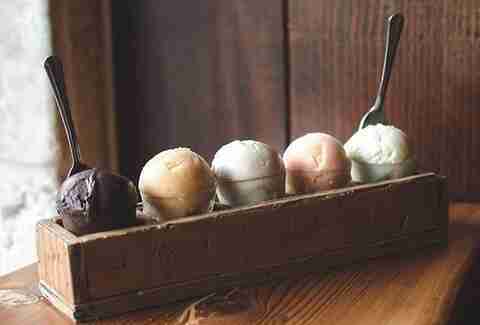 Pick from their rotating selection of flavors, and they’ll set up five mini scoops for you to enjoy. When you get to make five ice cream choices all at once, you no longer have to longingly eye the ice cream case and wonder if you’ve made the right choice. Most of the ice cream flavors change every two weeks, though they keep a couple classics on the menu year round. 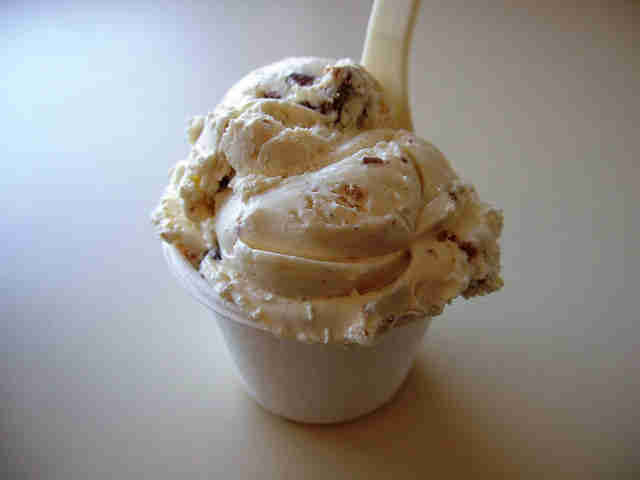 Make sure to include a scoop of their classic peanut butter chocolate fudge ice cream in your flight. Four words: Grown up Choco Taco. Rocko’s Ice Cream Tacos offers a spin on a childhood favorite, and their EMT is the perfect ice cream taco makeover: they take a freshly baked waffle cone-style taco shell and stuff it with zingy espresso ice cream, then dip the thing in milk chocolate to create a hard, chocolatey shell. Mmhm. If for some strange reason you're espresso-averse, you can create your own customized ice cream taco with their menu of ice creams and dips, or try one of their other decadent sweets, like ice cream cake pops and frozen s’more tacos. The ice cream truck travels all over the Bay Area, and this summer they will be in the Upper Haight on the last Thursday of every month. What’s more summery than cherries and ice cream? 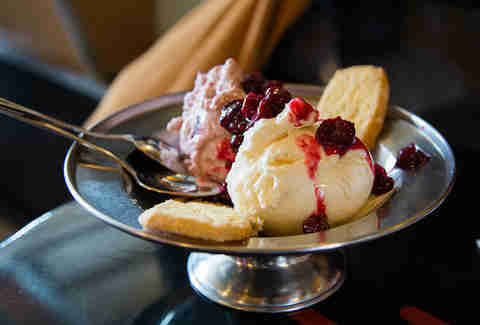 Ice Cream Bar SF offers a riff on a berry shortcake with this cherry-laced sundae. A scoop of crème fraîche ice cream and a scoop of morello cherry ice cream are drizzled with cherry and rosemary sauces, then paired with buttery cornmeal shortbread. Bonus points for the charmingly old-school interior and full menu of classic soda shop drinks and treats. No Golden Gate Park day is complete without a dark chocolate dip cone from Twirl and Dip. Creamy vanilla bean soft serve gets scooped into a fresh waffle cone, then cloaked in rich dark chocolate and sprinkled with crunchy sea salt. And if you're stopping by the truck with vegan pals, Twirl and Dip offers a delicious range of vegan options, including a menu of organic frozen juice lollipops and chocolate-dipped frozen bananas. There’s a reason Secret Breakfast has achieved cult classic status. 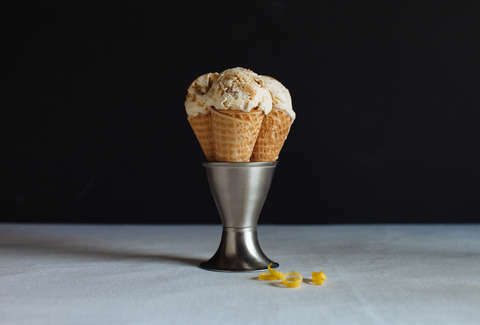 Rich bourbon ice cream studded with corn flakes is a frozen revelation that continues to delight, no matter how many times you try it. And if you're looking for the perfect second scoop pairing, choose from their revolving menu of seasonal favorites and chef’s choice selections. A little sun-splashed outdoor seating makes the Mission location the perfect place to soak up some rare summery rays as you enjoy your cone. The banana split is the martini of the ice cream world, a classic that, when done well, is down right transcendent... and St. Francis Fountain knows how to deliver the best. This joint has been slinging ice cream since 1918, making it San Francisco’s oldest ice cream parlor. The banana split is a veritable feast of flavors, with three types of ice cream, topped with sauces, whipped cream, and almonds, all balanced on a split banana. This timeless classic is best enjoyed in a similarly timeless atmosphere: slide into a booth, or hang out at the counter and enjoy St. Francis’ retro soda shoppe vibe. Souvla isn’t just churning out San Francisco’s buzziest spit-fired Greek sandwiches, it’s also home to one of the city’s most refreshing desserts: an elegant twist on the classic frozen yogurt. 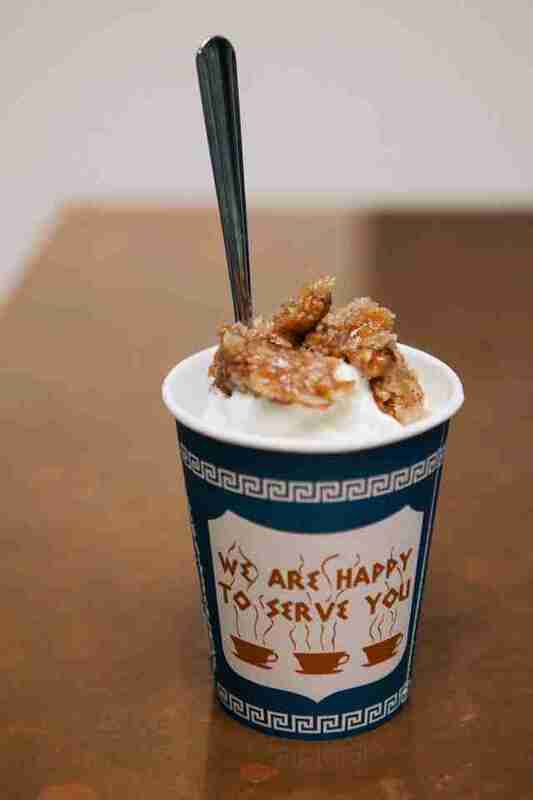 A tart swivel of frozen Greek yogurt gets topped with crumbled baklava and a heavy drizzle of honey syrup, then served in an iconic blue-and-white Greek coffee cup. Tangy, sweet, and aesthetically pleasing, this sophisticated froyo has all of your dessert bases covered. Watch in mouthwatering awe as the culinary geniuses behind the counter at Genki Crepes combine all of your favorite desserts into one handheld mega-treat: they take these fresh, golden crepes, and gently wrap them around a smorgasbord of chocolate ice cream, cheesecake slices, and a serious dollop of whipped cream. Roam the aisles of this Japanese convenience store while you wait, and pick up some Pocky and green tea Kit Kats for tomorrow, when your tastebuds have fully recovered. There’s very limited seating at Genki, so expect to take your crepe to-go. Fortunately, the Inner Richmond is the perfect place for people-watching and window-shopping as you take your giant crepe for a long stroll. From late spring until early fall, Mitchell’s is making their classic Halo Halo, a Filipino dessert chock full of bright flavors and delicious Mitchell’s ice cream. 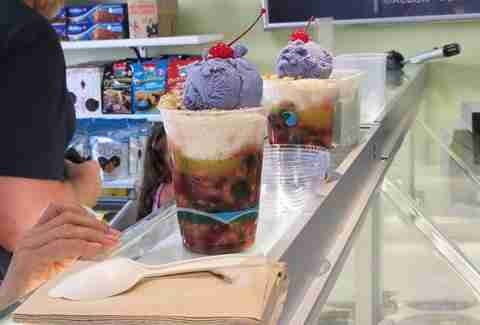 They combine sweet beans, ube, pineapple, palm fruit, and more with a splash of evaporated milk, poured over shaved ice and a scoop of ice cream. Halo Halo season at Mitchell's comes just once a year, so it's basically the Girl Scout cookies of the ice cream world -- get it while you can. Try out a sophisticated, savory-and-sweet spin on the traditional sundae. Decadent Bi-Rite chocolate ice cream is topped with a drizzle of bergamot-laced olive oil, flaky sea salt, and a dollop of fresh whipped cream. The results are an unforgettable and elegant explosion of textures and flavors. And if you're in the market for a major ice cream splurge (you are), Bi-Rite Creamery is also home to a full menu of ice cream pies and ice cream cakes. 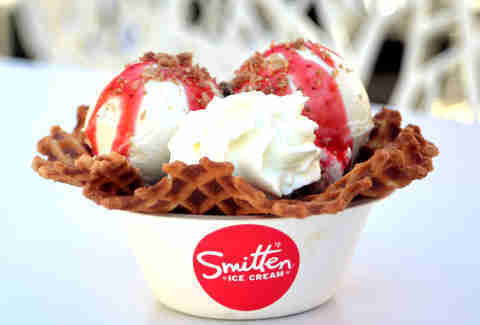 Smitten has turned the best parts of a summery berry crisp into a series of fresh sundae toppings. Classic Smitten vanilla ice cream gets a drizzle of strawberry-spiked prosecco sauce, then gets a dose of rich pie crisp topping and a cloud of homemade whipped cream. With ripe summer berries and made-to-order ice cream, it doesn’t get much fresher or more flavorful than a Smitten sundae. While there are only a few benches at the Hayes Valley location, nearby Patricia’s Green park is the perfect place to get some sun, or you can walk to neighboring Proxy theater to check out an outdoor movie. This place basically offers you an ice cream sandwich choose-your-own-adventure. Get creative as you mix-and-match your favorite freshly baked cookies with a menu of inventive ice cream flavors, including vegan and gluten-free cookie options, so everyone can join the party. If you're up for a different style of sandwich, swap out the cookies with brownies, waffles, or a taco shell. A favorite dessert spot in Asia, HoneyCreme just opened their very first US location in San Francisco. Their menu is full of wild concoctions, combining creamy, soft serve ice cream with a dazzling array of toppings. Start with their famous honeycomb soft serve cone: a crisp cone full of lightly sweetened fresh milk soft serve, drizzled with honey, and topped with a chewy chunk of honeycomb. Or go for the cotton candy affogato, which tops a swivel of soft serve with an airy explosion of cotton candy, then pairs the super-sugary combo with a balancing shot of espresso. Claire Margine is a freelance writer who always orders one too many sundae toppings. Follow her food adventures on Twitter @cmoshenb and check out her work at ClaireMargine.com.